The '68 and '69 models had no kill switch and had a front brake light switch built into the front brake cable. Those cables aren't reproduced, and made the brake feel spongy anyway. What sort of mufflers did you buy? Yeah, after you buy something expensive, stop looking at other ones for sale. You're bound to eventually find a better and/or cheaper one if you keep looking at them, causing regrets and grief... All things being equal, the early ones are worth more than the later ones, so keep that in mind. As for the mufflers, you will have to abandon the stock mid-pipe brace (if it's still on the bike) and make something of your own to secure the headers and mufflers. In the stock location, the header pipes are too close together and too close to the rear shock to just bolt the mufflers on and go, so the pipes will have to be splayed slightly and the brace won't fit any more.. The bracket(s) you fab need to be strong and support the pipes well, because if they move around too much, the header flange can break off at the head. Last edited by 83XLX; 04-11-2019 at 09:34 AM. I can send them back. The issue with my shorty pipes, which fit really well, is no baffles. Their installation instructions suggest: nstallation Tips: Most factory CL exhaust systems are welded together and will require you to cut at least one of the mufflers off of its respective header pipe. How far back each header can be cut depends on the sub-model of your specific bike. 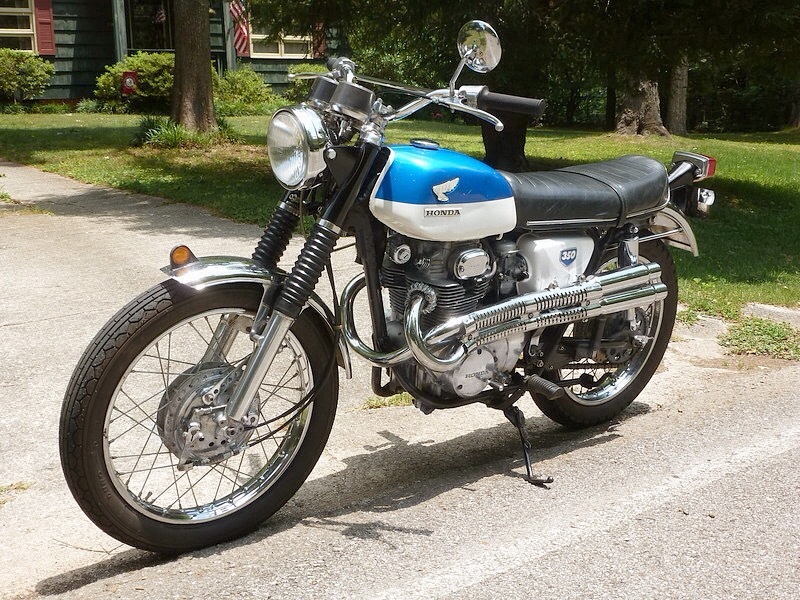 For instance, the CL350 K0 headers remain straight further back on the bike than the later models 350s and 360s. Your bike will require its own custom bracket. No two bikes are exactly the same, and where you cut the header pipe makes a significant difference in where your mufflers can mount and how your brackets will fit together. Regardless of which bike you have, it is a good idea to replace the Copper Exhaust Gaskets while you have the system apart. Since these mufflers are universal parts, they will need somewhat custom brackets to fit your bike. Fortunately each muffler comes with a generic bracket that should allow you to derive a solution with no more than a hack saw and a power drill. See above pictures of one such solution on a Honda CL350 K4. In this example, the top bracket mounts to the rearmost end of the mounting slot in the top muffler. This bracket received a hole to hang the lower bracket, a notch to clear the shock absorber, and a second hole to mount to the shock stud (M10). The lower mount bolted to the lower muffler mounting slot near the center, extending upwards parallel to the shock absorber, ultimately connecting to the upper bracket with a M8 bolt, lock washer, and nut. The whole process took a drill press, two drill bits, a hacksaw with a multi-purpose blade, a file, and roughly an hour of time. Depending on the diameter of your shock absorbers you may want to trim down the mounting bracket on the lower muffler so they don't interfere. Looks like they explained it pretty well. Could you buy some decent baffles for the mufflers you have now? I used to have those same shorty mufflers on my '69 (the ones that were on yours when you bought it), and they were LOUD, even with the baffles that came in them. I managed to fit them and use the original mid-pipe bracket, made a custom rear bracket, and they just cleared the rear shock. I finally found an original '68-'69 system and installed it. I never liked the way it ran with the stock setup (maybe the muffler had a dirt dauber nest in it or something ...lol), and I eventually converted it to CB pipes. Good luck with it - be patient and ask a lot of questions. I am ordering some baffle fabric from Drag specialities to try to make my existing pipes work, too. The parts fairy arrived today bringing air filters, mirrors, carb rebuild kits, petcock and mufflers. Mufflers won't be opened up until I see if repacking the shorties provides reasonable results. Rebuilt the carbs this evening. Won't be able to do anything more until maybe Sunday. Anxious to see if I can get the bike running next week. As to carb rebuild, any suggestions on initial setting on idle mixture screw. I started with 1.5 turns. 1.5 turns out from lightly seated is the typical starting point. I know a lot of the guys really don't like the aftermarket manuals. But I like a manual that I can prop up on the table and read while working. Opening up my tablet and phone don't get it for me. I enjoy reading manuals while watching baseball games. So is the Clymer manual for our bikes that bad of an option. Doubt that I will find a hard copy of a factory service manual. I have the three series set for my 71 F100 and I always have a service manual for whatever Harley I happen to be driving. Any suggestions for wire to tie up the baffling material to the baffles. Among items I need to get are the rubber bushings for the rear shocks, the inserts on the side panels (one fell off). I have ordered the upper/lower bushings for the handlebars. I also would like to take a look at improving the wiring above the engine. Looks cluttered to me. I think the Clymer manual has a few mistakes in it, but I don't remember the specifics. I believe they are in the timing and/or valve adjustment sections. I printed those sections (and a few more) out from the on-line Honda manual and stuck them in my Clymer for reference. I'd look a 4into1 or David Silver Spares for those parts you listed.